"Official League Of Angels Strategy Guide And Players Guide!" I Guarantee You Will Not Find Any Other League Of Angels Guide Like This! Step By Step League Of Angels Strategy Guide With Diagrams, Formations, Character Builds, And the Secret League Of Angels Forum! League of Angels offers many daily events for online players to complete for great rewards that will help increase your character building abilities immensely. The game has high quality images and graphics along with detailed customed boss battles. Set in the fantasy era complete with warriors, mages, angels, dwarfs, and even wolves. The game gives players multiple options to customize their hero formations, obtain custom armor and weapons from erebus and other dungeons, players can assemble a custom squad of allies and equip gear that is upgradeable. The basics of the game is that you are to help release the angels to help you fight the evil that has plagued the land. Your chosen hero and party will travel through many different parts of the world defeating and completing quests to unlock and release the angels one by one. Starting off in the Elf Village as a lone hero you are given task to complete that will help you build up your character and create a team of heroes to fight with you to save the angels. Travel through Yggdrasil, the World Tree, Forgotten Realm, Dark Forest, Flamesburg, Dragons Nest and more completing quests given to you by the Elf Priestess, Thea, Ranger Jilleon, King Nori, Wolf Lord Muttor and many other characters in the game. Take part in these quests and various other aspects of League Of Angels to conquer the game. The league of angels recruit heroes guide will help you understand how to recruit heroes and what are the best heroes you can use when you are starting out in the game. This chapter explains how to efficiently recruit powerful heroes to help out-smart and out-play other players in the game. This basic guide has been designed to help you get started and is not a complete strategy guide by any means. Learn how to get the MAX amount of gems! The League of Angels Strategy Guide explains the many different ways of obtaining free gold. Some of these include, accomplishing your "daily tasks", using the alchemy, and stealing from other player's gardens. Erebus is a maze of sorts which allows your character to move from the beginning all the way to the end where you fight a ferocious boss. When you move you have certain events that appear, these events will be questions, enemy encounters, karma, treasure of erebus, and other events. Each of these events will either give points or take points away. The more points you earn before getting to the boss the more card pick attemps will be allowed after fighting the boss. Discover great ways to become more powerful with our League of Angels cheats. Read all about cool tricks and tips in the League of Angels Game. Find more cheats tricks and gameplay strategies in our Secrets section! Available as an eBook (PDF) downlaod right to your computer or device. 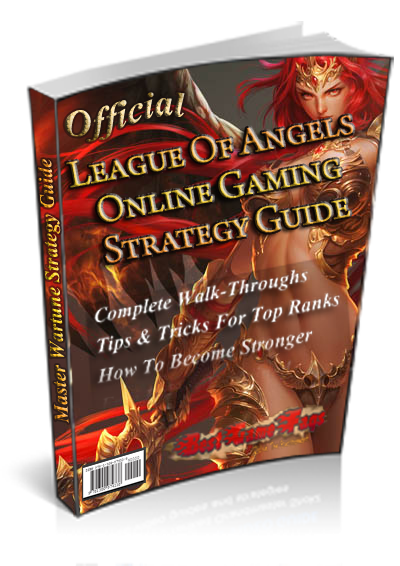 Order the Official League Of Angels Strategy Guide Now! © 2019	BestGameFaqs All Rights Reserved. All League Of Angels images, characters, and other copyrights belong to their respective owners.